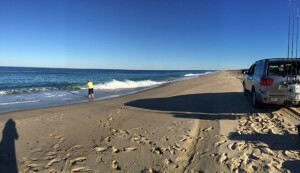 We spent a week in Nantucket in early October. 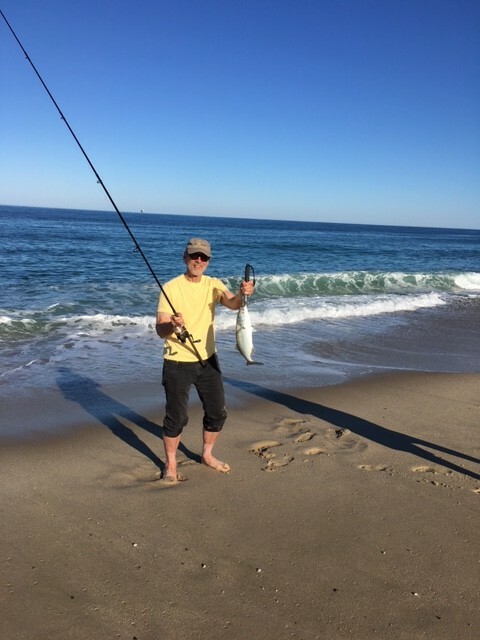 Not too many folks around then, and I finally realized my dream of having a go at surfcasting. The first afternoon attempt was a complete bust. The inn provided an experienced guide at no cost who let the air out of his tires to 15 pounds and drove us on the sand. Nada for two hours. But I never give up. Two days later I tried again, and this time I hooked five and landed three. Of course I wanted to eat them, but Captain Rob preferred to throw them back. It was very exciting to reel them in with the cold water crashing around and the nearby seals waiting to steal my hooked fish. I’m not much of a fishing enthusiast, but this was definitely a thrill. And I didn’t mind at all that my guide knew where and when to go, what kind of pole and lure. I felt very satisfied and proud. When I was actively turkey hunting with a shotgun, I use to make fun of those who hired a guide to take the hunters to exactly the right place, do the calling, bring the bird into easy shotgun range and then pat the client on the back when it was time to take a shot. I was doing everything myself: the scouting, locating the roosts, knowing when to arrive in position, calling after watching videos and hearing the hens in the woods. A long and challenging process. But a few-days-a-year visitor to the ocean or the woods is handicapped. Can’t learn all it takes. Guides are good. I accept my limitations and have more respect for my colleagues from out of state. It was great fun, and much better when I caught fish, even if I had Captain Rob’s help.